Did you know it was national pillow fighting day last Sunday? Neither did I. That is until I wandered up towards Plaza Catalunya at about half past seven thinking to myself how wonderful it would be if somebody had written a blog post about the location perfectly balancing the witty and informative to ensure that the reader, while never lost, was always smiling. However, I was distracted by this brief happy epiphany by the sight of a lagre group of Mossos (Barcelona's Riot Police) standing in one of the nearby streets. Now the spotting of large groups of Mossos can mean only one of two things. It's either a) Trouble with a capital T or b) Barcelona is hosting this years World Championship of Extreme Angled Beret Wearing. And, as all fans of beret wearing know, that competition is to be held in Beijing this year (China having recently discovered the beret and already made great strides in international competition – despite critics have pointing out that a number of these fast-improving Chinese beret wearers have tested positive for using anabolic strings of onions). Astute readers will have noticed the BigBarcelonaBlog is partial to the odd bit of Rock 'n' Roll and so it will come as no surprise that his response to trouble was to go looking for it. Had he come to the right place? All the signs were there. 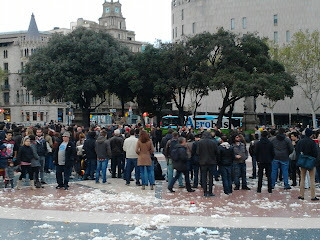 There were numerous Mossos riot vans in every sidestreet and the Guardia Civil were in the Plaza itself. The Guardia Civil are the police too but they aren't as dangerous as the Mossos – this is demonstrated by the far more responsible angles at which they wear their berets. The BigBarcelonaBlog couldn't wait to see what had happened. Had the Indignados returned? 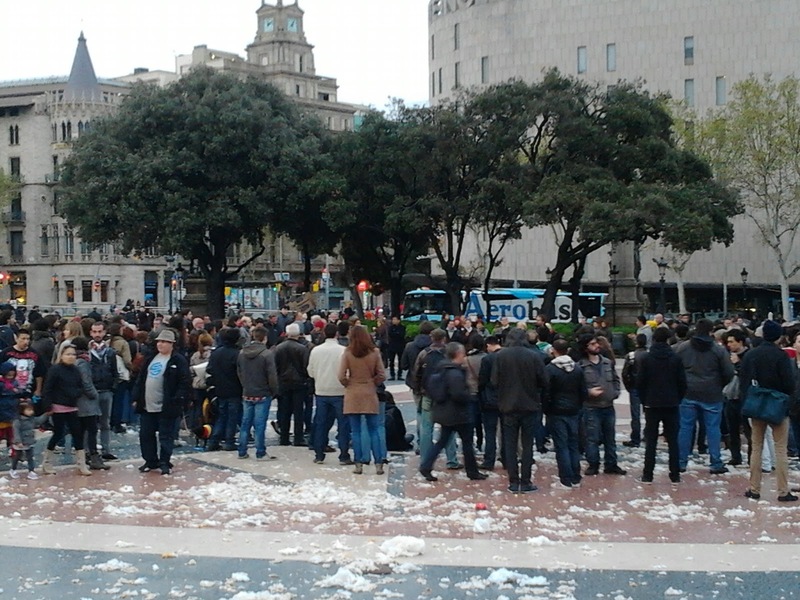 Was the city once more to be rocked by the idealistic fervour of 15-M? 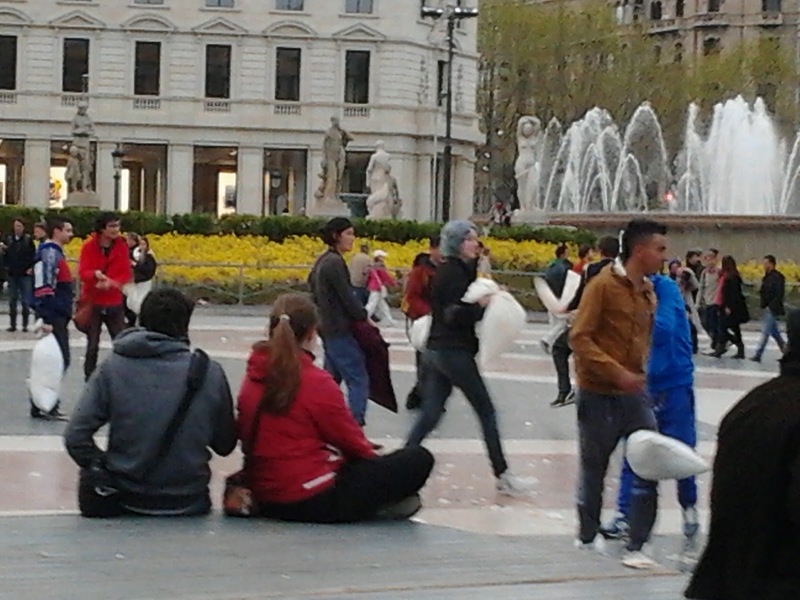 There were twenty kids joyfully hitting each other with pillows. 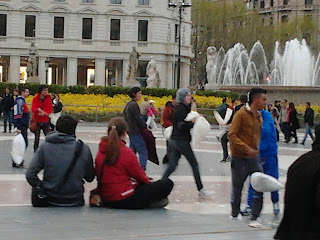 The BigBarcelonaBlog was mystified. Even Britain, despite enduring more than a decade under the scarily authoritarian boot of New Labour has, so far as I know, not outlawed pillow fighting. On the opposite side of the world it's a similar story -the Taliban, despite banning chess, music and female education and health, have so far yet to get around to prohibiting the pillow fight (it is a little known fact that Mullah Omar defeated Osama Bin Laden when they went goosedown to goosedown during a half time break at the Kandahar football stadium back in 1999). N.B. Any Americans reading this please substitue soccer for football. Any American CIA operatives reading this please substitute “I am making this up” for “this is valuable intelligence I should pass on to my superiors”. There is absolutely no need to extraordinarily render me to Guantanamo again. I learned my lesson after the whole Abu Hamza relaxes by entering North London subbuteo tournaments debacle. I mean I'd have thought it was obvious. But nineteenth months in an orange jump suit taught me never to take Langley's sense of humour for granted. 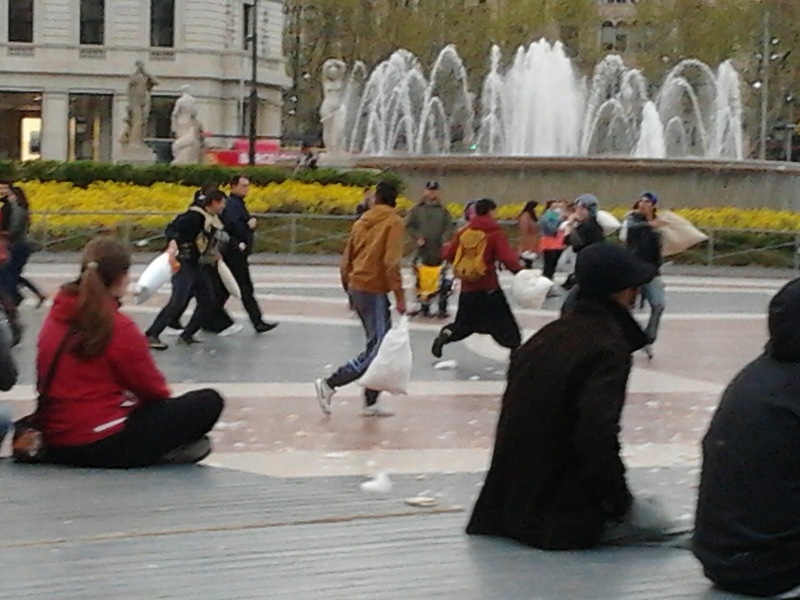 Anyway, back to Plaza Catalunya and the tense Mossos/Soft Cushion stand off. At least that's what I thought it was. Then I realised I'd made a mistake. The Mossos were not there for the pillow fighters. Standing close to the these doughty down wielders was another group. This group were forlorner than our feather flinging friends. I had initially assumed this was because they had already fought and lost and the feathery residue of their weapons now lay on ground like so many fallen snowflakes. But no! On closer inspection they turned out not to be well plumped warriors at all but instead to be protestors. I suppose I should have guessed this because they were stationary and as we know from this post all Spanish protesters have one thing in common. They never move. Even the marchers. Actually, especially the marchers. Anyway this was a rather sad and small group of protestors and they were being addressed by a man with a surprisingly quiet megaphone – a minorphone, if you will. The use of any kind of phone wasn't strictly necessary as all the people were quite close enough to hear his normal speaking voice but I suppose when you've gone to all the trouble of bringing it, it feels kind of a waste not to crank it up to get that irresistable British Rail Tannoy announcement vibe going. Whilst adding undeniable authenticity the minorphone did have the drawback of rendering me utterly unable to decipher what the protest was about and therefore give it extended publicity by mentioning it here. 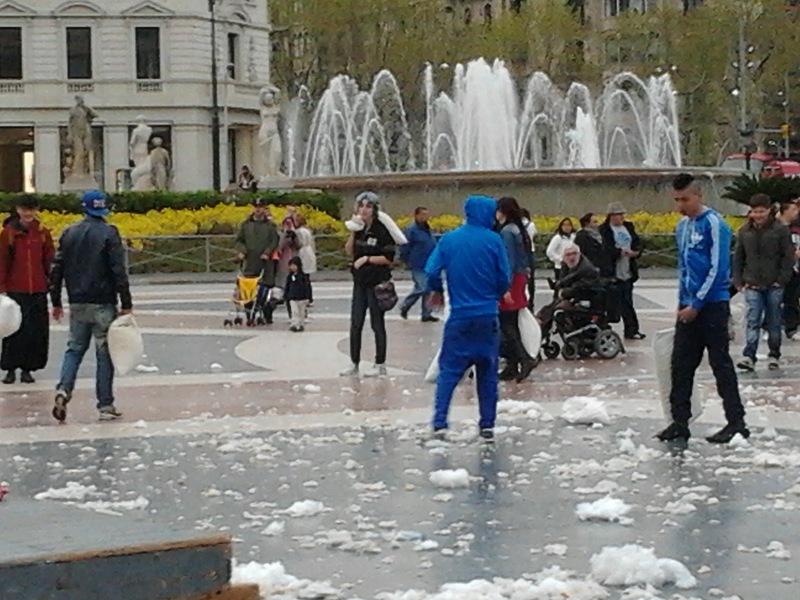 It's a problem left wing groups worldwide have run against over the years and frankly the BigBarcelonaBlog despairs. We're never going to bring about global change, comrades, with muffled slogans. So his fellow protestors were glumly not hearing him while all around them kids were clonking each other with pillows and all around them was a watching cohort of riot police. I wondered about if the protesters, unexpectedly, decided to join the pillow combat the authorities would intervene as this would constitute direct political pillow action which would threaten to undermine the structures of the state as opposed to normal pillow fighting which would just undermine the structure of the pillow. But despite my fervent wishing the protestors refused to oblige me. So I guess I'll never know. And now thanks to this post neither will you. So you may be wondering why I posted this. Well, you see I've been filling this blog with long helpful information and in my last post I thought I'd experiment with some short helpful information. But that didn't work out so well...see here . So I thought I'd try some long unhelpful information instead. If you try new things people you don't get anywhere as someone famous once said. Come to think of it – it might have been Icarus.